Siesta Key resident artist Brian Wigelsworth has worked in many mediums but has most recently found his niche in sand. Through national and international competitions he has become one of only about 75 Master sand sculptors in the U.S. It didn’t take him long to realize Siesta Key’s fine shell-free sand was ideal for hosting a master sand sculpting competition. So after three years of planning, last year he created The Siesta Key Crystal Classic Sand Sculpting Competition. The event was so successful it’s first year his company, Sand Lubbers Sandvertising Agency, was able to partner with the World Championships of Sand Sculpting to have the Crystal Classic host the World Championship’s doubles division. Their work will be showcased on Siesta Beach, recently named America’s No. 1 beach in Dr. Beach’s 21st annual Top 10 Beach List. The list is produced by Dr. Beach, also known as Dr. Stephen P. Leatherman, Director of Florida International University’s Laboratory for Coastal Research. Dr. Beach compiles his top 10 beaches list annually and Siesta Key has consistently placed in the top 10. This community event is chaired by Bob and Eileen Parkinson, organized and operated by volunteers, and is a partnership between The Greater Sarasota Chamber of Commerce, Sarasota County, the Siesta Key Chamber of Commerce and Mote Marine Laboratory, Inc.
Quick Sand Speed Sculpting Competitions: Watch your favorite sculptors competing in these fast-paced contests. Flying Colors with John Gowdy: See the Paint and Sand Fly… Watch as the image appears before your eyes… in a matter of minutes! Paintings will be auctioned after the performance. 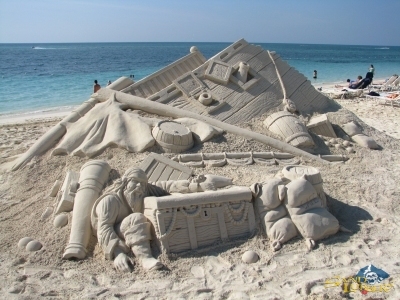 Sand Sculpting Lessons: Hour-long sand sculpting demonstrations by Sand Lubbers Sandvertising Agency. Veterans Day Sculpture: A special welcome sculpture carved by Brian Wigelsworth of Sand lubbers Sandvertising Agency to honor our veterans. Mote Marine Laboratory’s Mote Mobile: On Friday, Saturday and Sunday, Mote Marine Laboratory’s Mobile Exhibit will be on site. The mobile features a reef exhibit with live fish and hands-on touch tanks. Amateur Competition: Fun for the whole family. 9 a.m. to 1 p.m. Sunday. Six divisions, including teams and solos. Photo Opportunity Sand Sculptures: Have your picture taken from inside the sand in these Holiday-themed photo opportunity sculptures. Live Music and Siesta Key Chamber of Commerce Vendor Village: Friday, Saturday and Sunday. For More Information: For more information, please visit www.CrystalSand.org or call1.800.398.0270. Dates: Nov. 10-14. Competition begins on Nov. 10 with winners announced on Nov. 13. Sculptures will remain available for viewing on Nov. 14. Cost: $5 per person, per day. Must have an admission bracelet to enter. Purchase entry bracelets at the gate or at the satellite parking lot at Phillippi Estate Park. Parking: Parking and round-trip shuttle available Friday through Sunday for $5 at Phillippi Estate Park, 5500 South Tamiami Trail, Sarasota, 34231. First bus departs Phillippi Estate Park at 8:30 a.m. (the last departure from Phillippi for the beach will be at 4 p.m.) and last bus leaves Siesta Beach for the return trip to Phillippi at 5:30 p.m. Shuttles will run throughout the day. VIP Parking: VIP Parking is located adjacent to Siesta Key Public Beach. VIP Parking passes must be purchased in advance online at crystalsand.org. Cost: $49 for one, three-day parking pass or $59 for one, three day parking pass and two three-day admission bracelets. Mote Marine Laboratory is seeking volunteers to help staff the 2nd Annual Siesta Key Crystal Classic. To learn more and to register to volunteer, go to crystalsand.org.